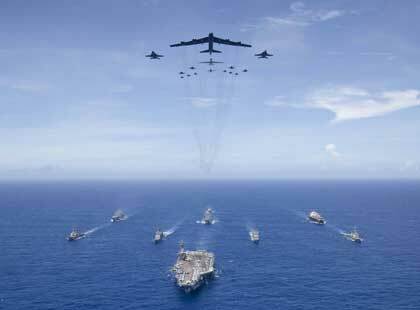 PHILIPPINE SEA The aircraft carrier USS Ronald Reagan (CVN 76) leads a formation of Carrier Strike Group (CSG) 5 ships as U.S. Air Force B-52 Stratofortress aircraft and U.S. Navy F/A-18 Hornets pass overhead for a photo exercise during Valiant Shield 2018. The biennial, U.S. only, field-training exercise focuses on integration of joint training among the U.S. Navy, Air Force and Marine Corps. This is the seventh exercise in the Valiant Shield series that began in 2006. U.S. Navy photo by MC3 Erwin Miciano. Navy Credentials Program Wins "When Work Works Award"